The main street of Atlanta, Peachtree Street, runs the length of downtown Atlanta on out into the city's suburbs through Buckhead and beyond. Believed to have originally been an indian trail, Peachtree Street is home to many major Atlanta attractions, including: the Westin Peachtree Plaza Hotel (and its observation deck from the 72nd floor), the Margaret Mitchell House, and Lenox Square (a 250 specialty store shopping mall). 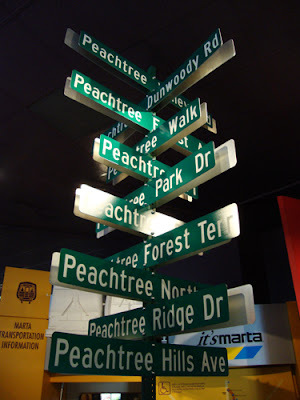 The use of the word Peachtree doesn't end on Atlanta's main street...actually, there are approximately 60 streets throughout the city that use Peachtree in one form or another. When you hear locals say "Turn on Peachtree and go..." or "follow Peachtree until you get to..." they're most likely talking about "the" Peachtree Street, otherwise they'll very likely add a descriptive (Road, Circle, Terrace) indicating a street other than Peachtree Street that bears the word Peachtree. I laughed aloud at this one! Been enjoying both your pix and your comments.